Brighton War Memorial figure, Newbury Trent . Newbury Trent is one of those transitional sculptors who trained up in Edwardian times, worked through the art deco period, and later turned to art deco, surviving through to produce work after World War II. With a couple of exceptions, it is his earlier work which is his best, at least so far as those pieces I have come across, notably his World War I memorials. He lived and worked throughout his life in London, being born in East London, at Forest Gate, Newham (which at that time would have been part of the County Borough of West Ham), and working mostly in Chelsea. He studied at the RCA, and the Royal Academy Schools, being awarded a scholarship for sculpture in 1909, and was linked to the prominent sculptor Gilbert Ledward through marriage to his sister, Hilda Ledward. His early work included allegorical figures, and he later turned to portrait sculpture, as well as working as a medallist. 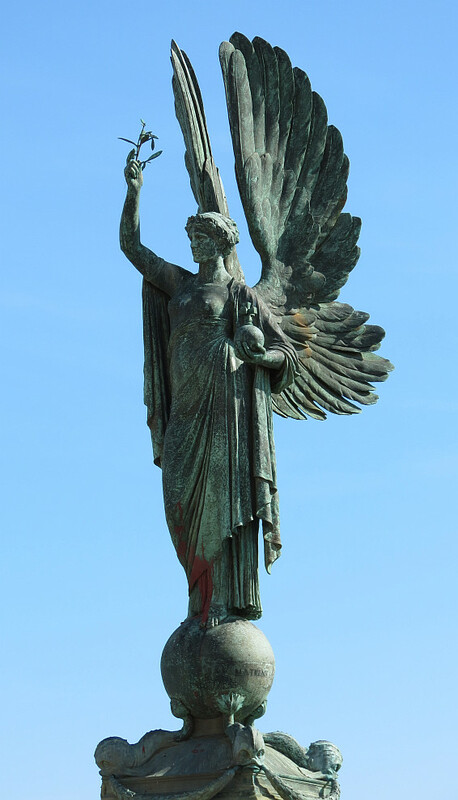 His war memorials generally fall into two groups – those depicting soldiers, and those centred on an Angel of Peace. It is these latter which are his best works by far. The most well known of these figures is actually a memorial to Edward VII, on the esplanade in Brighton, more or less forming the boundary with Hove (see this page). An almost identically posed figure on a tall pillar forms the New Barnet War Memorial, not so many miles from where Trent was born, and a similar one on an obelisk forms the Wanstead War Memorial, a little further out in the east and north of London. In North-East England, Tyne and Wear, is another version on a tall pillar, which is the Wallsend War Memorial. All of these were put up in the 1920s. Panel by Newbury Trent for Apollo Victoria . Back in London, his later work can also be seen. The best of this consists of two inspired deco panels for the Apollo Victoria (which opened in about 1930 as the New Victoria Cinema), opposite to one exit of Victoria Station on Vauxhall Bridge Road – lively and amusing pieces showing cinemagoers watching a romance and a murder mystery (there is also a humble figure of Charlie Chaplin). The panels feel rather the work of an illustrator than a sculptor. The architectural partnership which built that building included William E. Trent, the sculptor’s brother. Rather different architectural sculpture by Trent can be seen in his panels for 3 St James Square, called the Buchanan Building, depicting town criers. Again illustrative, these are competent, but worthy rather than exciting.